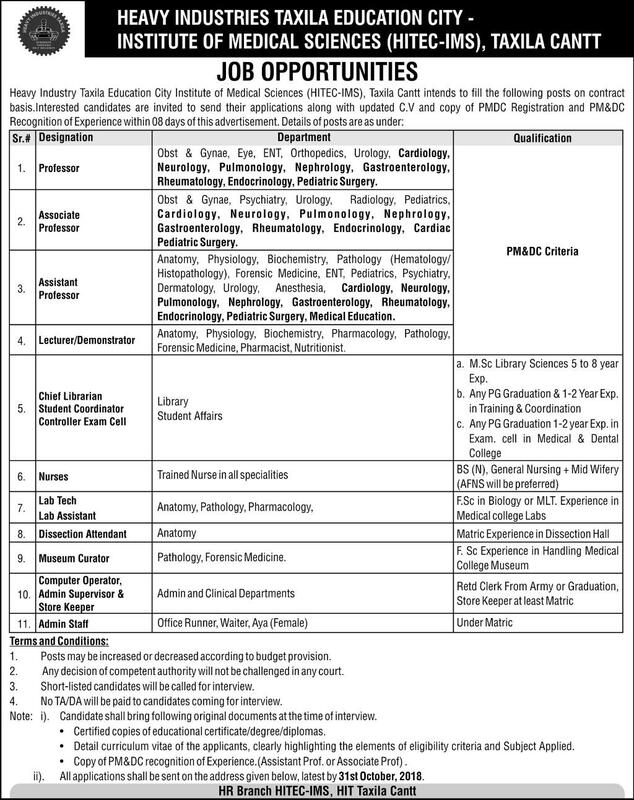 HIT Education City Institute of Medical Sciences (HITEC-IMS) Taxila Cantt Punjab. Department: Obst & Gynae, Eye, ENT, Orthopedics, Urology, Cardiology, Neurology, Pulmonology, Nephrology, Gastroenterology, Rheumatology, Endocrinology, Pediatric Surgery. Department: Obst & Gynae, Psychiatry, Urology, Radiology, Pediatrics, Cardiology, Neurology, Pulmonology, Nephrology, Gastroenterology, Rheumatology, Endocrinology, Cardiac Pediatric Surgery. Department: Anatomy, Physiology, Biochemistry, Pathology (Hematology/ Histopathology), Forensic Medicine, ENT, Pediatrics, Psychiatry, Dermatology, Urology, Anesthesia, Cardiology, Neurology, Pulmonology, Nephrology, Gastroenterology, Rheumatology, Endocrinology, Pediatric Surgery, Medical Education. Department: Anatomy, Physiology, Biochemistry, Pharmacology, Pathology, Forensic Medicine, Pharmacist, Nutritionist. a. M.Sc Library Sciences 5 to 8 year Exp. c. Any PG Graduation 1-2 year Exp. in Exam. cell in Medical & Dental College. Qualification: F.Sc in Biology or MLT. Experience in Medical college Labs. Qualification: Matric Experience in Dissection Hall. Qualification: F. Sc Experience in Handling Medical College Museum. Department: Admin and Clinical Departments. Retd Clerk From Army or Graduation, Store Keeper at least Matric. 1. Posts may be increased or decreased according to budget provision. 2. Any decision of competent authority will not be challenged in any court. 3. Short-listed candidates will be called for interview. 4. No TA/DA will be paid to candidates coming for the interview. 5. The candidate shall bring the following original documents at the time of interview. • Certified copies of educational certificate/degree/diplomas. • Detail curriculum vitae of the applicants, clearly highlighting the elements of eligibility criteria and Subject Applied. ii). All applications shall be sent on the address given below, latest by 31st October 2018.